Tether is a so-called stablecoin, meaning that its price is artificially maintained on the level of value of some other real-life asset. In our case, USDT coin price is pegged to the current price of USD, hence the name. However, it not as simple as we would like it to be when talking about the price of USDT. If you’d like to read more about stablecoin concept – visit the article about it on BitcoinWiki.org. The specific look of the Tether price graph can be somewhat confusing. How can there be fluctuations in the Tether to USD ratio if USDT price is pegged to United States dollar in one to one proportion? Even more so, the Tether price history includes more than one case of unexpected price drops. In order to explain Tether price prediction we should take a closer look at the technology that powers the price of the coin. The most notable USDT price drop happened on April 25, 2017, when the price got to the mark of 0.91 USD. The drop was caused by the news of the international wires in Tether being rejected by the Taiwanese banks. The following market panic forced traders to sell their USDT coins and making the price of USDT much lower. 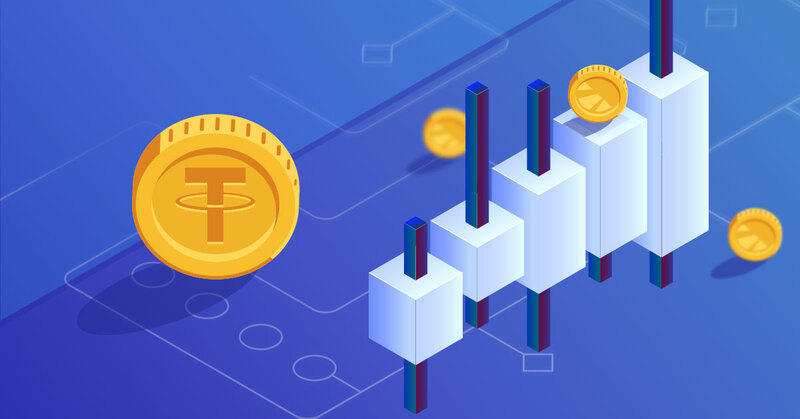 At the same time, the cryptocurrency exchanges that used Tether as an alternative to USD experienced a significant increase in the price of Bitcoin and other cryptos that were traded in pairs with USDT. The Tether price connection technology doesn’t provide an algorithm that can be stable enough to fix the price of USDT in such a short term. Some of the USDT news for 2018 include another price drop that happened on the 16th of October. This drop wasn’t caused by a natural market fluctuation but by an attack. The organization that is responsible for the attack remains unknown to the public. The Tether price drop was performed in order to increase the price of other assets (specifically Bitcoin). The drop was performed by making a large sell of USDT. While Tether was falling in price, its changing ratio to other cryptos provided them with an enormous but short-term increase in price. So, what can be said about the future price of the USDT cryptocurrency? The most probable case for the USDT coin price is its remaining within the close to 1 to 1 ratio with United States dollar for the following year. However, it is now obvious that the coin cannot be 100% trusted even with the specific case that is was developed for. It is possible that the coin will fall a couple of times in the future hitting a mark of no less than 90 cents per coin. Various attacks or market falls can move the USDT coin price. However, the coin has shown fast recovery speed after its previous downfalls and these price shifts can only damage traders in a particular way of interrupting their current trading strategies. Despite multiple predictions of the future fall of the dollar, Tether will still be a stable asset to store value in. The USD price volatility is not often seen as an important factor that should be accounted for in cryptocurrency trading and not without reason. The huge market volatility of the cryptocurrency industry makes it look like tiny price fluctuations. However, the most likely driving factor of the possible rise of cryptocurrency market is a downtrend of the traditional financial markets. If you are one of the enthusiasts that invest in crypto for a long-term gain, you should be careful with the USDT cryptocurrency. Not only is it not really a representer of your ability to immediately exchange the cryptocurrency to fiat but also the fiat it is theoretically representing is flawed in its financial positions.